Some people think that embroidery is a skill that young people of today will not be interested in. Who wants to sit there creating chair covers covered with tiny stitches? Probably not that many people. But what about little designs for shirts, for purses, and for little gifts? What about putting colorful butterflies and roses, or seashells and sea stars on summer hats? These are the kinds of projects which would be fun to do. In this kit young people will find that they have everything they need to learn how to embroider. 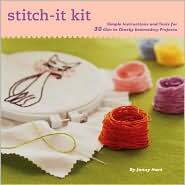 There is a 7-inch embroidery hoop, an embroidery needle, seven skeins of colorful embroidery floss, 2 tea towels to practice sewing on, 35 iron-on patterns, and an instruction book. The iron-on patterns include letters and numbers, banners, motifs of various kinds, a cat, food items, a French poodle, and the Eiffel tower. The instruction book is written in a breezy and cheerful way, with the author emphasizing that embroidery need not be old-fashioned and it certainly is not arduous. It is an inexpensive hobby that can be relaxing and very rewarding. In her introduction the author explains that embroidery has a long and illustrious career and we should not let out preconceptions of this art form put us off. The author then goes on to give her readers easy to follow instructions on how to use the tools included in the kit and how to get started. Next she explains how to do some of the basic stitches that are used for embroidery. These include the split stitch, the stem stitch, the back stitch, and the pretty chain stitch. The author shows her readers that none of these stitches are difficult to do and once they are mastered, the possibilities are endless. A well written and engaging little manual and a complete set of the basic tools of the craft make this an excellent gift for a creative person who is eager to try something new.